to Silverlady's Ladies of Anime gallery!! There are no spoilers on this page!! Awards for You to win! Anime is slang for a show /movie usually from Japan. Commen features of anime drawings are large eyes with small noses and mouths. There are misconceptions about anime, especially in the states. Some people hear animated and immedatelly belive it is for childeren, this is not true. 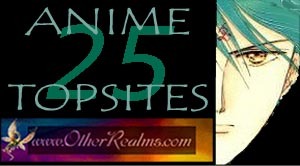 There are many types of anime, from comidies to tragidies, even triple X anime ( by the way there's none of that here.). Anime is not the same as an American cartoon. Anime can have a strong moral/ political message that is not in keeping with the average "cartoon". I've seen theroies on evolution and enviromental consevation seems to be big themes in anime. Of course, it IS entertainment. Your bound to find a man/woman bouncing around in a bikinie with the Sword of (insert something here), out to single handedly destroy an army of (choose one) monsters, space aliens, evil humans, or robots for personnal revenge. So that just a little over view of what anime is about. I've several pages of a couple of my favorite anime shows. This will be story lines with accopaning pics of some anime shows that I have seen and liked. So if you looking for something to watch, click on the name and find out more about it! (no spoilers) Devil hunter yohko will be moved there. Laugh outloud- Pages dedicated to the funniest altered images on the web. No show or character is safe!! Too Much Pages - How to tell if you love something just a little too much! More awards for you to win! Please pardon any spelling mistakes. Feel free to Email me with thoughts, suggestions, and other websites for pics or sign my guest book! Link to me! Do it now!! The people who make, create, and produce these shows desevre all the praise they can get. I don't intend to steal this praise from them, just to showcase their stunning work.